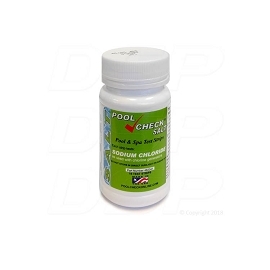 Swim in soft, silky water with chlorine that you produce. Say goodbye to red eyes, skin irritation and harsh chemical odors with Saltron®. By adding mild salt solution to your pool, Saltron® changes the salt ions in the water into chlorine to sanitize your pool. The salt solution is undetectable and its concentration is less than that of human tears. For in-ground or above ground pools up to 20,000 gallons. 1 year warranty. I needed a salt system that didn't have to get installed into the pool pipes. This has been working well and is super easy to install. Looks like a kids guitar but works good. 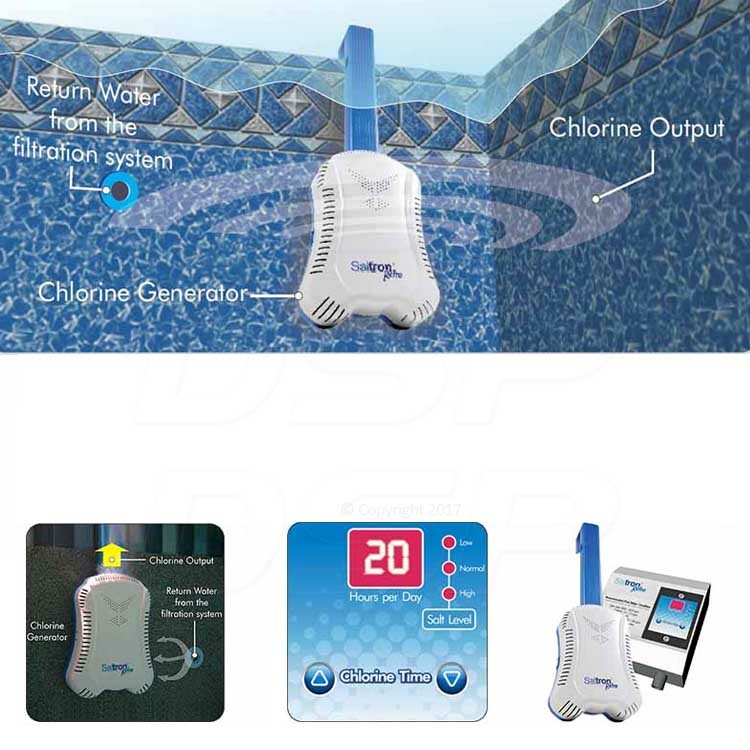 This was really perfect, it was easy to install, and I haven't bought any chlorine since. I have an intex pool and this just hung over the side, and I just plugged it into an outlet. Q: I have a new above ground 18 foot round pool. Which would be best for that sizE pool? Should I look for something else? A: That size pool is about 7000 gallons, so the Saltron Retro would work well. It has the advantage of requiring virtually no installation, it just hangs over the wall of your pool and plugs in to a standard 110v outlet. It is a great way to save on chemical costs for a couple seasons, but if you're looking for the most long term savings, take a look at systems which install in the pool plumbing and offer longer lifespans and warranties. A: This model simply hangs over the wall of your pool and plugs in to a standard 110v outlet. Like all salt systems, it creates a pure form of chlorine every day so that you don't have to buy any more chlorine, shock, or algaecide. Additionally, it works consistently every day so you don't have to struggle keeping the pool clear. Q: I have a 15,000 gallon pool. In 24 hour period how many hours would my sand filter have to run to make the salt system run correctly? A: As a starting place, the rule of thumb for pool run-time is one hour for every ten degrees of temperature outside. It will ultimately depend on your pool's needs, which is different for everybody. Q: I have an above ground pool that is 18ft round and 4.5 deep. I only have the "cheap" filter that comes with those types of pools. I am just hearing about the salt water system and very interested in purchasing one. I don't know where to begin. Can you help? A: Absolutely! 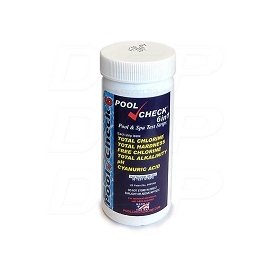 This is a very popular salt chlorination system for your size pool. 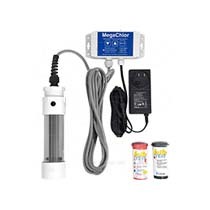 If your filter/pump is working, you'll typically keep it and just add in this salt chlorinator. This is what will sanitize the water so you don't have to add more chlorine, shock, or algaecide. One of the reasons this model is so popular is that it takes virtually no work to install it, you simply hang it over the side of your pool, and plug it in to a standard outlet. Give us a call if you have more questions, 866-766-5243! Q: Will this work to switch 27ft by 52" pool to saltwater from chlorine? A: Your pool size (about 17000 gallons) is very near the peak of this system's capacity, especially if you're in a southern climate. You would probably want to get a system rated for at least 25-30000 gallons. Q: what size chlorine generator is suggested for 27ft round above ground? A: If you multiply 27 x 27 x 4.5 (depth) x 5.9, that comes out to about 19,300 gallons. Depending on your climate and pool use, you would benefit most from a system with a maximum stated capacity in the 30,000 to 40,000 gallong range. Q: I am writing about our church baptistry. Am I right to assume we could use this and salt to maintain it, instead of chemicals of we drained and refilled it? It is essentially a loner fiberglass pool size 10'x5'x4'. A: You don't necessarily need to drain and refill just because you are adding a salt system, but yes, it looks like you've got about 1500 gallons of water, and these systems cover up to 10000-15000 gallons so that should surely be capable of sanitizing that much water. A: That's about a 15,000 gallon pool. That is probably near the max of this system's capabilities, especially with the pool being in Florida. Take a look at some of the other systems that get plumbed in (instead of hanging over the pool side, like this one). 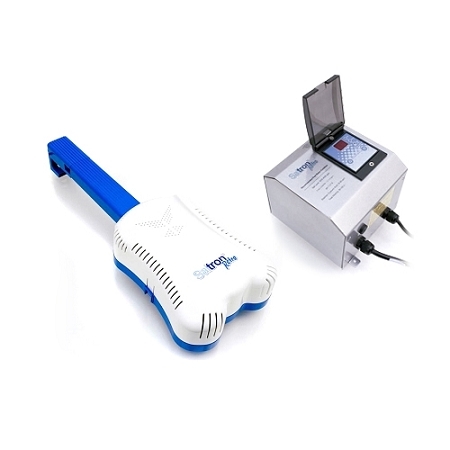 You can get double the power and much longer lifespan for not too much more.